1959 Chevrolet Impala in San Diego, CA for sale. 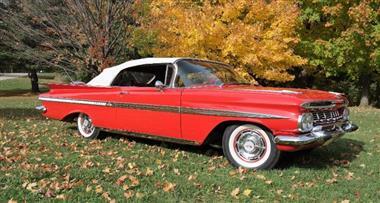 This beautiful 1959 Impala Red Convertible with a white top. This car presents and shows really well. It is powered by a 348/280 Horsepower Tri-Power V-8 with a rare 4-speed manual transmission with �coat hanger� floor shifter. The exterior paint is from a past restoration and is still in an extraordinary condition which matches the style plate 932A Roman Red. 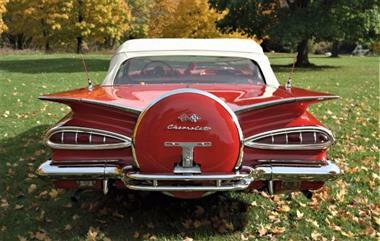 The frame and underside were both restored. 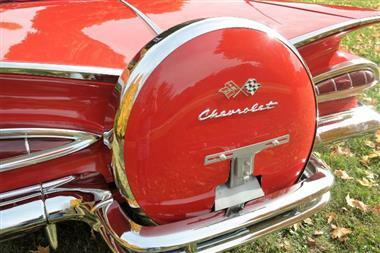 The frame was painted black and the underside was painted the factory red oxide color. 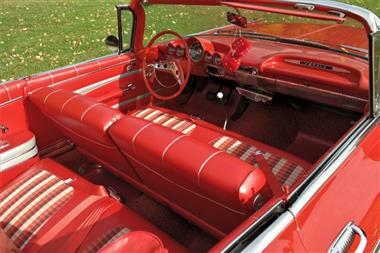 The interior is the original red in very nice condition with no rips or tears. 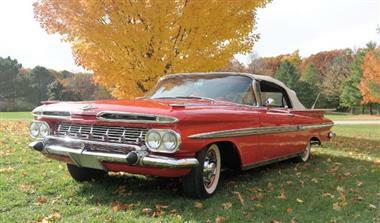 It is factory optioned with: power steering and power brakes Continental Wheel Carrier 2nd dummy antenna Deluxe group (sun visor, armrests, fenders, and cigarette lighter) Tissue dispenser Push button radio.